Does your preschooler love to make art? 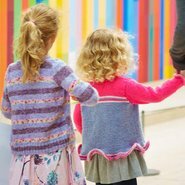 Join us for a fun artmaking tour of the Gallery to develop their creativity and improved fine motor skills. For ages 3-5, with an adult.